Was born in 1823. 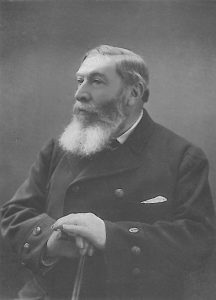 He commenced his yachting career in 1858, and no yachtsman has gained the esteem of his brother yachtsmen in a greater degree than he did. 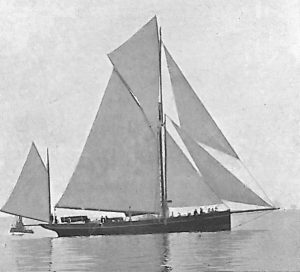 Chanticleer, Yawl, 122 tons. Mr. G. Herbert Brown. His first yacht was the cutter North Star. 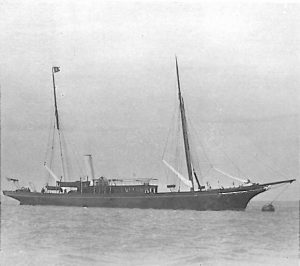 He owned the auxiliary schooner Nora Creina, the s.y. Helen, and the yawl Chanticleer. In 1881 he bought the s.y. Aline, 373 tons, the boat being then one year old, and she was his property at his death. that time he held the appointment until his death, which took place in February, 1907. His popularity in the position was amply shown at the com­plimentary dinner marking his completion of fifteen years of office, and on various other occasions. He was a member of the Yacht Racing Association. Aline, S. Y., 373 tons. Sir David Gamble, Bart. Clubs: Royal Anglesey, Royal Irish, Royal Mersey. Residence: Windlehurst, St. Helen’s, Lancashire.